According to anthropologists, the Homo sapiens of 40,000 years ago had the same brain power as we do today. Modern man, misunderstanding evolution, prefers to believe that humankind has progressed and improved since the stone age. It is difficult to believe that people today arent smarter, better, and more sophisticated than our ignorant, superstitious ancestors, but science has shown that we are exactly the same species that once huddled fearfully around the fire wishing that the darkness would end. Science can also show us how clever, resourceful, and reasonable our ancestors were. Myths and legends provide important clues as to how early societies took shape. 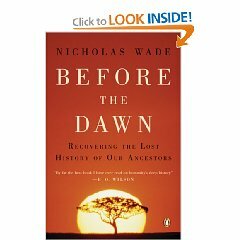 Dawn Before the Dawn is a scholarly examination of the concepts of a Golden Age and Ancient Wisdom. Beginning with an carved ivory artifact from 25,000 BCE, Ashe explores ancient beliefs about paradise as it spread from the steppes of Russia to India, Persia and Greece. Rich in discussion about shamanism, Indo-European migrations, and comparative religion, Ashe provides a basis for understanding our ancient ancestors. This is a complicated book, but worth the study. If I had found it first in a library, I would have bought my own copy anyway.